RYAN: I fully expected to be completely trashing this movie because all the clips that were pre-released online looked blasphemous to a fan of the original Annie! The music is synthesized, lyrics altered, voices autotuned and choreography weak. I was all set to hate this movie. RYAN: I loved it! Seriously, from the very first moment of the film, it hooked me and I was even getting misty-eyed a few times throughout it. All the clips I’d seen online previously, that I thought were horrible, actually worked within the context of the film. It’s good. I liked it very much and am so surprised. CAROLINE: I’m surprised too. It just seems like such a bad idea. RYAN: It’s not. Remakes are tricky. You really can’t touch a classic and it’s ambitious for sure, but when a story is a good story, new adaptations bring it to a new generation in a fresh way. And the original still exists to be enjoyed. So now there’s more Annie to groove to in the world. And a new face for Annie that African American kids can identify with more directly. It’s fantastic. CAROLINE: Wow. Ok, I get it. So you didn’t mind even the lyrical changes? RYAN: They are a bit jarring if you know the words to all the songs like I do. I love Annie. I was Daddy Warbucks in 6th grade. 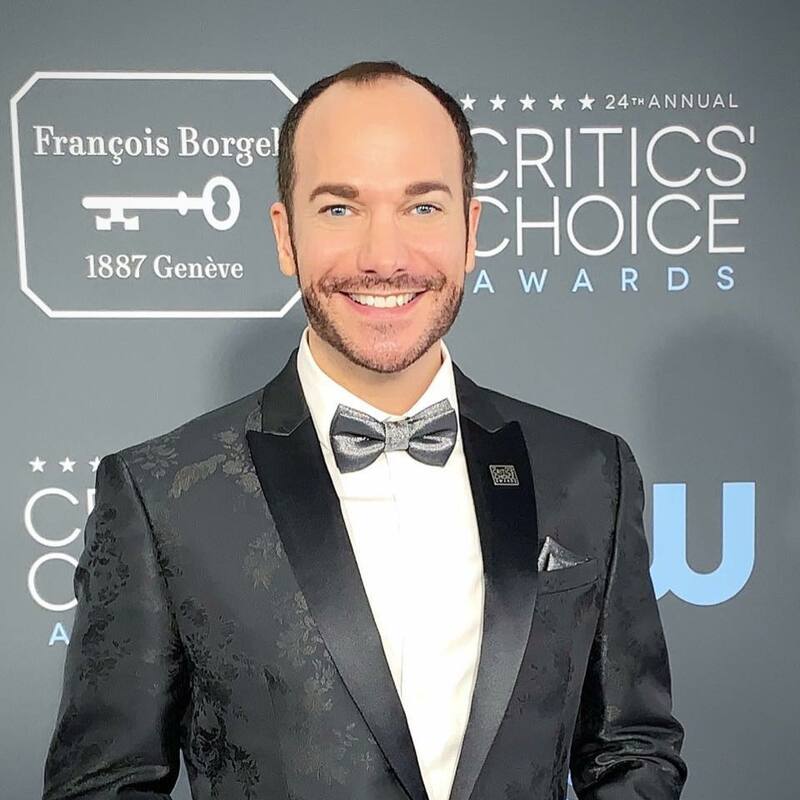 It’s a great show and especially the made-for-TV version, directed by Rob Marshall and with Kristin Chenoweth, is amazing. CAROLINE: That one is more directly adapted from the Broadway show than the first theatrical movie? RYAN: Correct. And as long as you let go of that when you watch this new version, just going along for the ride and embracing the newness, it’s so fun and it’s well done. It’s a very different beast but the heart is the same and ultimately, it’s fun entertainment. CAROLINE: Anything that really didn’t work about it? RYAN: Cameron Diaz. It’s the worst casting in movie history! She’s horrible in acting the role and singing even worse, like, it made my ears bleed every time she sang. Atrocious. I’d rather chew and swallow glass than listen to her sing. CAROLINE: (laughs) Whoa that’s bad. Why didn’t they get someone better? RYAN: Please. Chelsea Handler would have been brilliant in the role. Or Sarah Silverman, or anyone funny basically. Cam D was hein. CAROLINE: How’s the rest of the cast? Quvenzhané Wallis got a Golden Globe nomination for this. Is she that good? RYAN: No. She’s not Best Actress material in this. I don’t knowhow she got that nomination. She’s good but I don’t always buy her as an actress. She’s not a dancer. She’s not much of a singer; but she couldn’t be cuter and she’s certainly effective in this role. CAROLINE: What about Jamie Foxx and Rose Byrne? RYAN: They’re great. I like them both. You know sometimes Jamie can be annoying but not only was he likable here, I actually fell in love with him a little bit in this movie. It was like discovering Jamie Foxx. He’s a great actor and the best singer in this film. So talented. And Rose is cute. Bobby Cannavale is also decent by sings about as well as Cameron. Eek. CAROLINE: I can only imagine how frustrating it must be to be a working actor on Broadway, with real talent, seeing people like Cameron Diaz in movie musical adaptations. True talent should win out over box office draw, but alas, it’s all about the quon at the end of the day in Hollywood. CAROLINE: How are the new Sia songs? RYAN: I didn’t like them. They don’t fit in with the melodic vibe of the original songs, so they stand out as really out of place and they slow the movie down. 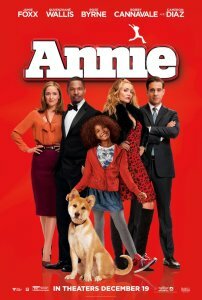 The original Annie songs are fun, musical, cute, clever. The Sia songs are ballads that sound like they belong in a different show. CAROLINE: I hate that. They should have hired songwriters more appropriate to the tone of the production. RYAN: Seriously, they should have had current, contemporary musical theater songwriters do it. Even the Golden Globe nominated song, Opportunity, is a wreck. The costumes are great. It’s the one redeeming thing about Cameron as Miss Hannigan – her costumes and hair. And the sets are terrific. Making Daddy Warbucks a billionaire is cool. He’s not called Daddy Warbucks though. He’s Mr. Stacks. RYAN: Yes – some brilliant ones at a cinematic moment. Loved that. CAROLINE: I’m happy for you that you enjoyed it. RYAN: My expectations were certainly lowered since I disliked the clips I’d seen online, so that may have helped. But it also just looks great on the big screen and works well as a complete piece. If you’re inclined at all, see it in the theater. It may lose something on TV. I had heard nothing but terrible things about it but I think it’d be difficult to have that much talent in a movie and not at least have an entertaining final product. Despite my previous reservations, I will see it now since it has Ryan Jay’s stamp of approval.